It's no secret that biotech investing could net you triple-digit returns, but not every biotech stock is a winner. The industry is notoriously volatile, and you could end up holding a dud just as easily as the next frontrunner. Over the last 10 years, the biotech industry returned 301.25%, while the S&P 500 only managed returns of 99.80%, according to Fidelity Investments. And those gains keep coming. For example, Menlo Therapeutics Inc. (Nasdaq: MNLO) climbed 72.63% since Jan. 25. But finding the right biotech stock to get behind isn't as easy as it looks. "It's almost impossible for someone without a serious biotech, medical, or chemistry background to have any idea about which companies will hit the jackpot and which ones will not," Money Morning Special Situation Strategist Tim Melvin told us. Just look at Solid Biosciences Inc. (Nasdaq: SLDB), which cratered 66.66% since Jan. 26. That's why you need an advantage over the market when investing in biotech stocks, and we're here to provide that leg up. 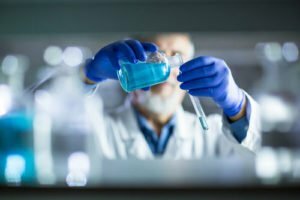 You see, biotech companies may boast about their grand plans, but the reality is, it's extremely difficult to launch a successful biotech product. "Only one in 5,000 drugs makes it from pre-clinical testing all the way to FDA approval in the United States," Melvin said. He's spent a lot of time crunching numbers and searching for the answer to the biotech investing conundrum. "We could just buy all of the biotech companies, but over the last 20 years, that has involved owning, on average, 213 stocks at a time. It is also a tad volatile, with several horrid years and a maximum drawdown of 84%. The sector beats the market rather handily, but 213 is a lot of stocks to own, and most people cannot handle the wild volatility." Fortunately, Melvin has developed a strategy to navigate through the volatile biotech sector that retail investors can follow. "The only way for me, as a value investor, to participate in the biotech revolution and profit machine without breaking my brain was to develop a purely quantitative approach to the problem," he told us. When he gives investing advice, we pay attention. And the simple strategy he developed will help our readers capitalize on the profitability of biotech stocks while also avoiding the massive volatility that comes with the sector….